Here’s how it works. When a problem occurs, swift and effective resolution can elevate repurchase intent to a level that’s actually greater than if the problem had never occurred at all. Every problem, if managed well, is thus an ‘opportunity’ to boost overall loyalty among a company’s already loyal customers. Spill soup on a guest in the hotel dining room? Solution: Offer on the spot to dry clean the suit or, if the damage is severe, offer to replace it entirely. The customer is delighted; the employee has done the right thing; the hotel raises that customer’s lifetime value. However, kindness is not saying please and thank you, or offering complimentary valet services, or hosting an annual holiday party, or making reparations for a clumsy waiter or rude receptionist. Depending on the business, these could be wise practices, but kindness goes as deep as doing all of these things when the fault is not your own, but of the customer, client, or even the employee. Take Joan, for instance. She held the title of editorial director for about six weeks when her boss, and owner of Stratospheric Resources, Jack, had her travel to Toronto to pitch her first catalogue of books to the Canadian sales force. After an overnight stay and a breakfast and lunch sales call in New York, Joan would fly to Toronto in time for a business dinner. Shortly after leaving her home base of Ft. Lauderdale, Joan looked out the window admiring her view above the Atlantic. Once the fasten seatbelt sign was off, she began to rustle through her bags, noticing one teeny problem: she had left her passport on her desk at the office. She was dizzy and distracted the rest of the flight, until the national accounts manager approached Joan about her sudden change in demeanor. After the manager broke the news to Jack, Joan couldn’t bear to look either of them in the face. So much for being at the helm of the editorial department. Joan never forgot her passport again, and never forgot the compassion Jack showed her on that trip. She had bigger things on her mind than her passport: a catalogue to pitch, new people to meet, and a staff to lead. Jack could’ve thought that he made a big mistake with his new hire, chastised her, and even put her on notice, but instead he afforded her the right to fail, trusting that turning the other cheek would result in her never letting him down again. Jack’s kindness was actually a motivator to his employee to pay it forward big time, in the form of hard work, loyalty, and personal accountability to the firm. If he had gone the other way, Joan believes she would have never made it to the sales conference or been able to connect on a personal and respectable level with her publisher. When you act in accordance with your character as well as your passion and purpose for your business, profits will rise, employee turnover will lower, and customer loyalty will skyrocket. However, kindness in all of its simplicity is a loaded word. It’s a term for a host of other traits, behaviors, emotions, and actions that must be exhibited on a daily basis in order to cash in on kindness. Just as we pay for goods and services using cash, credit, and even bartering, kindness currency varies. 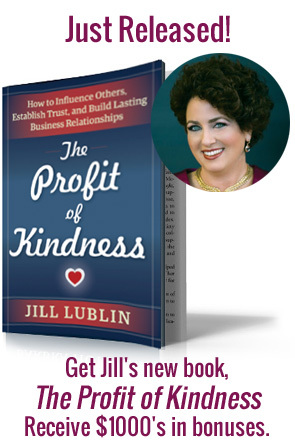 These characteristics or pathways can be used alone or in tandem to increase connection, prospects, and customers, helping you to begin brainstorming each kindness characteristic as a pathway to your business goals. “Do unto others have you will have done unto you” is known as the Golden Rule, and it isn’t reserved for religion. In business, we want to treat others kindly, and if we veer off course, this Golden Rule can act as a beacon for us to consider “Would I want this done to me?” However, when I discussed the use of the Golden Rule as a way toward kindness in business with my friend Ivan Misner, founder and chief visionary officer of BNI, he said he didn’t follow the Golden Rule at all. This sounded preposterous, after all Misner founded his consultancy business in California on the premise of “looking for referrals for my consultancy practice and for fellow business people who I liked and trusted.” Then Misner created the concept statement around which BNI now operates: Givers Gain. And it’s worked famously, as BNI now claims to be the largest business networking group in the world! Achieving that kind of intimacy, the familiarity with a person that helps you foresee what they need and want, requires we think of ourselves not first, not as golden, but as if the other is platinum, the first priority.